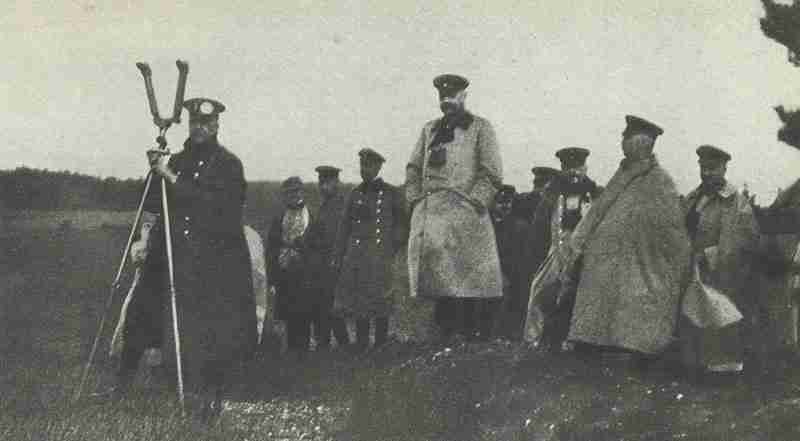 The German Army staff during the Battle of Tannenberg: in the center Hindenburg, right Ludendorff , at the telescope General Hoffmann. East Prussia: BATTLE OF TANNENBERG (until August 31). The Germans strike at Samsonov’s Second Army outside Tannenberg from the north and south, and also in the center. Russians evacuate newly captured Allenstein in their centre, leaving a 6-mile gap in their line. By nightfall on the 29th Samsonov has been surrounded and he is believed to have committed suicide. Attempts by Rennenkampf in the north to come to the aid of Samsonov’s beleaguered forces come to nothing. Tannenberg is a major German victory. Russian losses are enormous, their invasion of East Prussia is decisively rebuffed, and France and Britain’s faith in their ally on the Eastern Front is severely shaken by the crushing defeat. Galicia: FIRST BATTLE OF LEMBERG. The Austro-Hungarian broad-front offensive against the four armies of General Nikolai Ivanov’s Russian Southwest Army Group in Poland continues with mixed results. Battle of Gnila Lipa: Austrian Third Army against Russian Third and Eighth Armies, 2 Austrian divisions flee 25 miles back to Lemberg, the base for the Austro-Hungarian attack. At the Battle of Zamosc-Komarow the Austro-Hungarian Fourth Army pushes back the Russians. France: Two German Corps transferred from Western Front to Eastern Front; the Prussian Guard Reserve and XI Corps. Belgium: Fall of last 2 Namur forts and Longwy, 6,700 Belgian PoWs in all. French First Army falling back across the river Meuse. BATTLE OF LE CATEAU: British II Corps (Smith-Dorrien) with 55,000 men and 226 guns, fights day­long delaying action against von Kluck’s army with 140,000 men and 340 guns for 7,812 casualties (2,600 PoWs) and 38 guns. Sir J French, Joffre & Lanrezac confer at St Quentin but decide nothing. Kluck resumes independent command of First Army. Gallieni appointed Governor of Paris. Alsace and Lorraine: French withdrawing from there. Atlantic: Armed merchant raider Kaiser Wilhelm der Grosse, having sunk 2 British ships on August 16, caught coaling and sunk by British cruiser Highflyer at Rio del Oro off West Africa. Baltic: German cruiser Magedburg runs aground on Odensholm island, at the entrance to Gulf of Finland. Ship is shelled by Russians cruisers Pallada and Bogatyr, which take prisoners and recover priceless SKM codebooks and cipher tables. A copy goes to Churchill on October 13, 1914. Germans merely change key afterwards, do not learn about loss till 1918. Eastern Front: Russia’s premier aerobatic pilot and first air hero Staff Captain Pet-Kesterov killed when his Morane Type monoplane deliberately rams and destroys one of 3 two-seater raiders over his base in Galicia. Austrian Lieutenant Baron von Rosenthal and Nesterov both killed as first Austrian air casualties. Western Front: BE2 (Pretyman and Boyd-Moss) of No 3 Squadron flies armed reconnaissance mission of Le Cateau, Valenciennes and Cambrai, where they drops single bomb on parked motor transport near Blaugies village. They are hit by small arms fire west of Cambrai and have to land, burn plane and join retreating French cavalry towards Arras. Serbia: Serbian C-in-C Putnik orders Serbian Army to regroup for a limited offensive into Sava-Danube Srem region as prelude to invading Bosnia. Togo: An Anglo-French expedition operating inside the German colony of Togo land in West Africa wins a decisive victory at Kamina, which effectively destroyed the German presence. Major Döring’s surrender of 200 Germans, 800 Africans 3 MGs and over 1,000 rifles at Kamina. Radio station destroyed. Allied losses more than 120 men.